This Storify synopsis of the Gerlach trial provides background on the events of the trial so far. A year after fatally shooting Brendon Kaluza-Graham, who was speeding away in his SUV, Gail Gerlach told jurors the only thing he did wrong that day was mistake keys for a gun. “What I think I saw was a man with a gun, and what I’ve learned now is that he had his keys in his hand,” Gerlach said Wednesday morning during his manslaughter trial in Spokane County Superior Court. The case is now in the hands of the 12-member jury that will begin deliberating today. Gerlach said he wishes now he’d stayed in bed the morning of March 25, 2013, when he fired a single bullet that struck and killed Kaluza-Graham, who had stolen his SUV as it idled in Gerlach’s driveway. Gerlach estimated in court he saw Kaluza-Graham make threatening gestures from about 10 feet away. He opened fire within seconds, mimicking for jurors his steps, the unholstering of his weapon and firing “when the gun lined up with the driver’s seat,” he said. The defense rested after Gerlach’s testimony. Prosecutor Deric Martin told jurors during closing arguments that the evidence pointed to Gerlach acting recklessly, and it was up to them to decide if the homicide was justified. 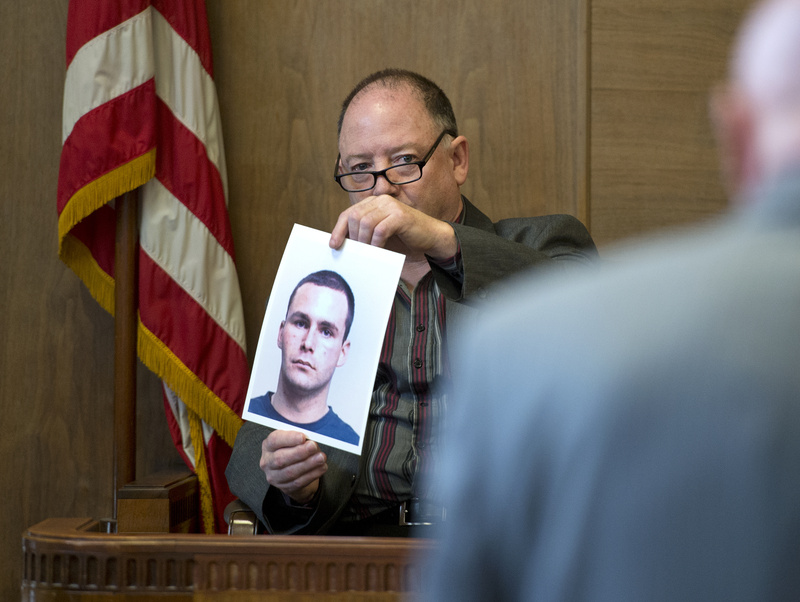 In the moments before pulling his weapon and firing, Gerlach saw what he thought was a gun in Kaluza-Graham’s right hand, the defendant said Wednesday morning. He said he could only see silhouettes but was afraid Kaluza-Graham was pointing a pistol at him through his back window. “I thought, ‘This is it,’ ” Gerlach said. Under questioning from Martin, Gerlach said he wasn’t aware children were gathering at a bus stop near where the shooting took place. But he said he would have acted in the same way even had he known they were there. “Even if you had been aware, as you testified in direct examination, any kids at that bus stop would have been collateral damage?” Martin asked. “In what way?” Gerlach responded. “In the way that, if you’d missed Mr. Kaluza-Graham or missed your vehicle, and hit one of them, that’s just a risk you were willing to take?” Martin said. “I didn’t miss,” Gerlach said. Gerlach added that if he took the shot again, he believed he’d be able to strike the truck or Kaluza-Graham. In testimony punctuated by hand gestures and pantomiming of his shooting actions, Gerlach told the jury that he shot because he believed if he didn’t, he would have been killed. “I thought I had to shoot to stop a threat that was in front of me,” Gerlach said. Martin said Gerlach’s actions leading up to, during and after the shooting were fueled not by fear, but anger. But defense attorney Richard Lee, in his own closing argument, said consistent statements throughout the trial indicated Gerlach feared for his life. “One major thing never changed: ‘I felt threatened,’ ” Lee said, referring to a statement Gerlach gave to Spokane police Detective Ben Estes about two hours after he fired. Estes was the first to testify Wednesday. He rebutted testimony from Sharon Gerlach, who told jurors she never said she believed Kaluza-Graham may have been giving them the finger when her husband fired. “She kind of reiterated what she thought she might have saw, which was … that somebody might have been flipping the bird, or reaching back,” Estes said. The interview was not recorded. Jurors will consider first the charge of first-degree manslaughter, which requires an element of recklessness. A charge of second-degree manslaughter is offered in the alternative, which requires that the defendant be criminally negligent in the killing of another person. Or jurors may determine the homicide was justified and throw out both charges.